PHOENIX, AZ (Nov. 9, 2009) — Three Phoenix-based authors will be autographing their Arizona guidebooks this Thursday, Nov. 12, 2009, in downtown Phoenix. 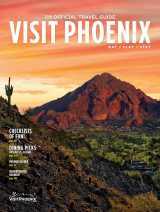 The travel books feature Greater Phoenix and the State of Arizona tips and information. The event will be held at the downtown Phoenix Visitor Information Center from 1-5 pm, located at 2nd Street and Monroe, across the street from the Hyatt Regency Phoenix hotel. This is the first such event to take place at the recently opened visitor center, which is located on the west side of the Phoenix Convention Center (look for the sign on the sidewalk out front). Aside from having the opportunity to meet the authors in person (cash-only purchases, please), a visit inside this unique tourist information center will bring you face-to-face with a floor-to-ceiling grid of nine 50-inch plasma screen TVs. They put the spotlight on Arizona’s desert landscapes and tourist hot spots—magnified and in color. The center also houses an interactive 43-inch iMap with touchscreen function to help you locate the nearest restaurants and nightlife venues. Additionally, you’ll find more than 500 state travel brochures—all of this for free. If you’re planning your upcoming Greater Phoenix weekends or out of town outings, the office provides the latest in visitor information. The books are ideal holiday gifts, too. For more information about the visitor center and the book signing, call 877-225-5749.